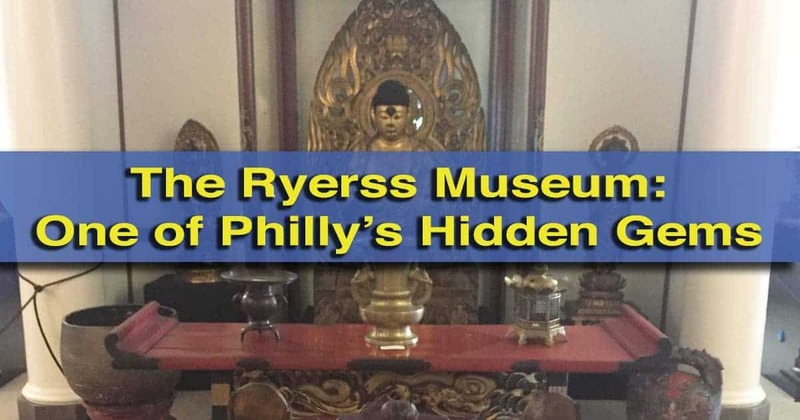 I’ve visited many fantastic museums in Philly, but few have been as interesting as the Ryerss Museum. 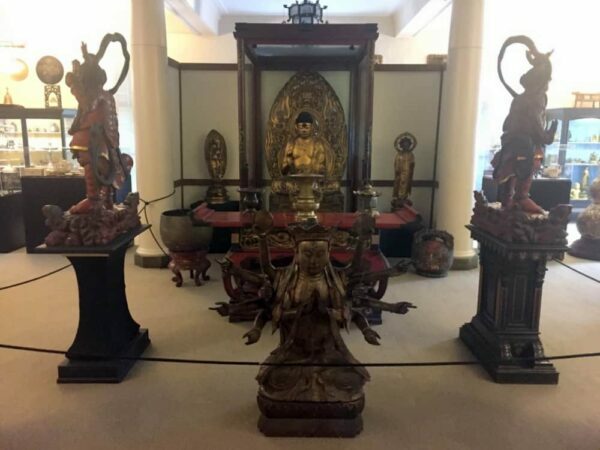 This little-known museum is located in northeastern Philadelphia’s Burholme Park in the Fox Chase neighborhood and is home to amazing collection of ancient Asian, European, and Native American art, religious pieces, and weaponry. The Ryerss Museum was built as a home in 1859 by Joseph Waln Ryerss. 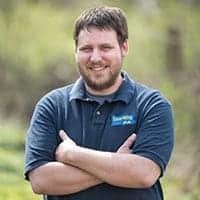 Ryerss was president of the Tioga Railroad in north-central Pennsylvania (which still runs excursion trains under the name Tioga Central Railroad). Then known as Burholme, the home was built on one of the highest points of land in the area. The Ryerss Museum sits on a bluff in Burholme Park. In addition to being a railroad tycoon, Ryerss was also a merchant and traded goods in China, Japan, and England. 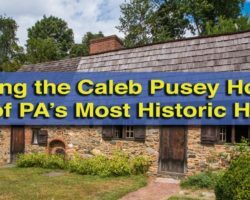 His association with and travels to these countries led him to collect many pieces of art and bring them back to his home in Philadelphia. After the death of Joseph Waln Ryerss and his wife, his son, Robert Ryerss, inherited the family home. The younger Ryerss continued both his father’s trading business and his collection of artifacts from around the world throughout his life. At the end of his life, Robert Ryerss willed the home to his wife of six months, who had also been his longtime housekeeper, Mary Ann Reed. In his will, he stipulated that the home be given to the city has a park and museum. 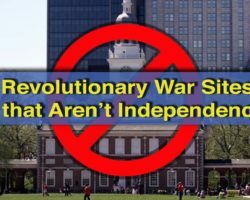 He further stipulated that the museum would be free in perpetuity. 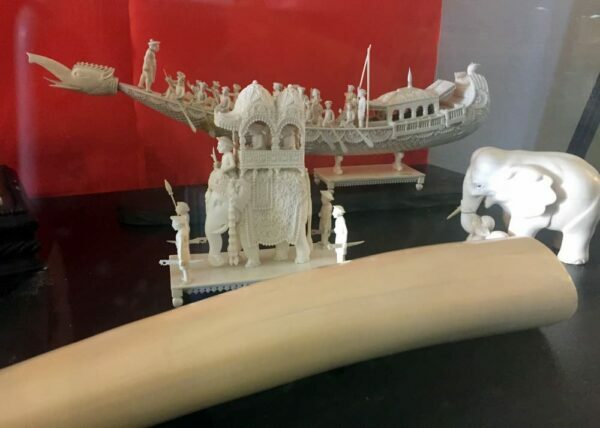 The museum is home to a great collection of ivory carvings. 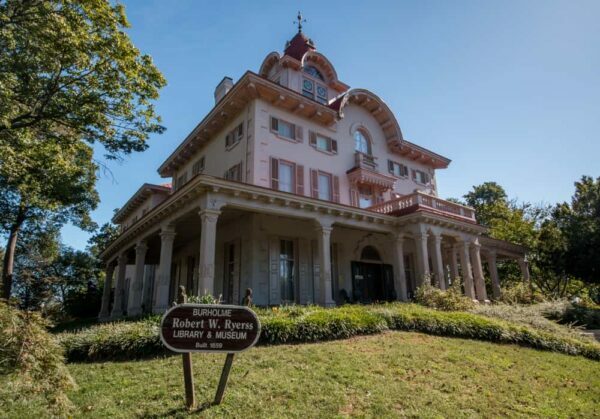 Mary Ann and her next husband, the Reverend John Bawn continued building the collection at the home, and, after they moved out in 1905, turned the home over to the city to become a museum. The Ryerss Museum and Library opened to the public in 1910. 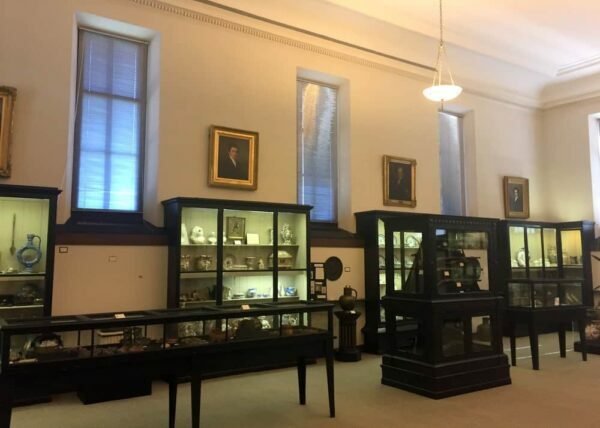 The museum is home to many fascinating pieces including an Asian art collection that is rivaled in Philly only by the Philadelphia Museum of Art, and rivaled as a private collection only by the Maridon Museum in Butler County. Thanks to the foundation set up by Robert Ryerss, the museum remains free for the public to visit. The entrance to the museum is on the home’s second floor which is now home to an independent library that is free for area residents. After grabbing a self-guided tour brochure, the tour of the home’s collection starts on the first floor. The home’s parlors contain items that were present in the home when the Ryerss family lived here. The home’s former foyer and parlors are now filled with collectables from all over the world, as well as furniture that once belong to the Ryerss family. The available brochures offer some information about each piece, as well as a quick overview of this influential family. While these front rooms contain many great pieces, most of the museum is housed in two large rooms at that were added to the rear of the home in the 1920s. The first floor room showcases the Ryerss Museum’s large collection of Asian art and religious items. Visitors can browse pieces from countries like China, Japan, and India. Being able to examine a variety of cultures in one place offers a great look into how these cultures differ. The museum in Philadelphia features a great collection of Asian religious pieces. One of the major highlights of this area is the three-foot-tall gilded Buddha statue. This piece dates back to the 12 century and is quite impressive to see. The museum also showcases a nice collection of carved pieces of ivory from India, tools used in various cultures, and religious items from Japan. 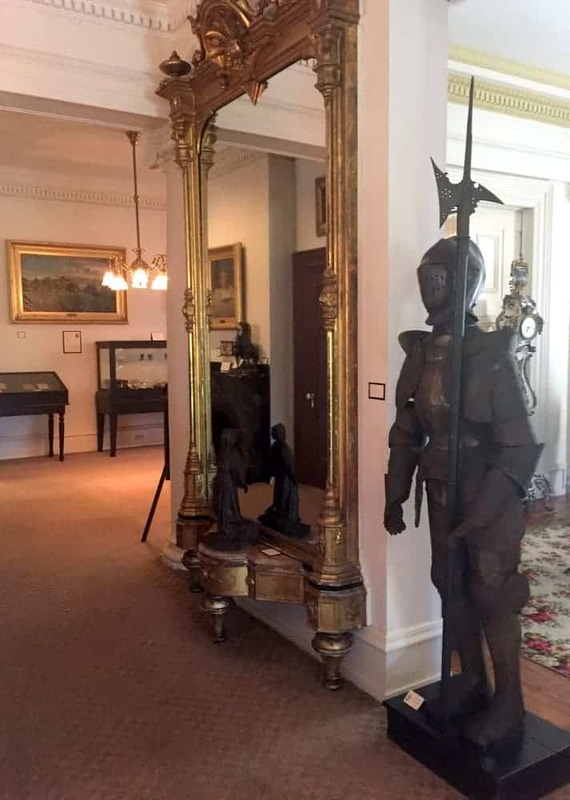 On the second floor of the Ryerss Museum, visitors can explore their collection European art and weaponry. While their collection isn’t large, it offers a great glimpse into these two aspects of European culture. I personally really enjoyed the pieces of weaponry on display as they offered a unique look at several different cultures. This floor also includes the museum’s collection Native American artifacts, representing a variety of cultures from throughout the continent, and pieces of China that were once owned by the Ryerss family in the 19th and early 20th centuries. The museum’s second floor houses its collection of European and Native American pieces. 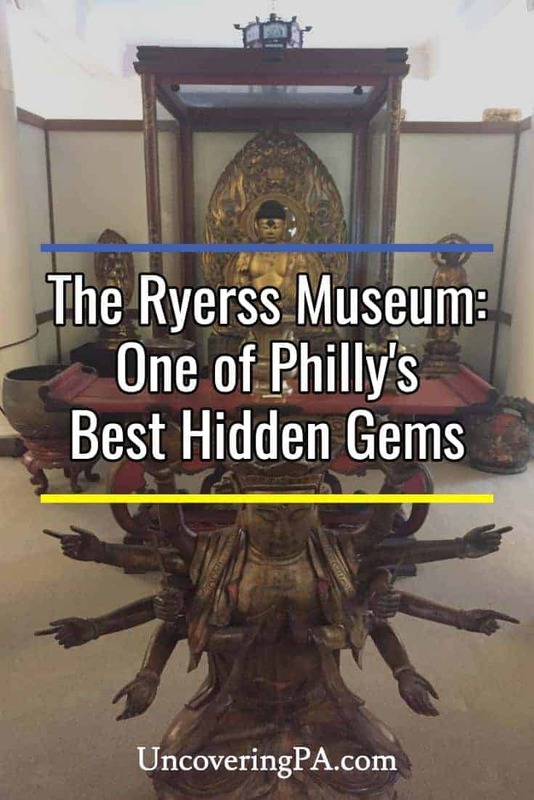 Overall, the Ryerss Museum and Library is one of the best hidden gems in Philly. The collection offers a fascinating glimpse into a variety of cultures from around the world that is usually only found in some of the state’s largest museums. 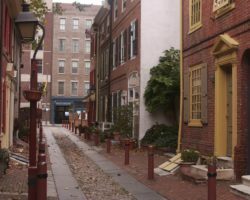 Even better, the fact that this great museum is one of the best free things to do in Philly and one of the best free museums in PA makes it a must-visit destination for lovers of history and world cultures. 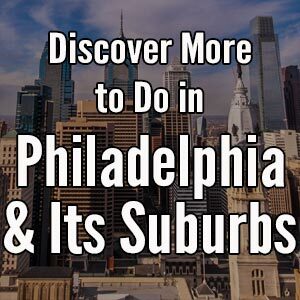 Looking for more hidden gems in Philly? 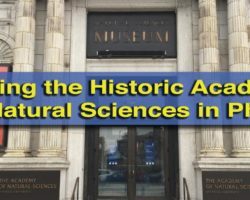 Check out the Rosenbach Museum, the John Heinz National Wildlife Refuge, and the Science History Institute.